I'm using the Roxio Creator 2009 Ultimate on a Windows 7 64 bit Ultimate O/S on a 2.8Ghz processor with 8GB of RAM. I captured hours of Video from work for a project. A lot of this involved my camera on a tripod pointing to a laptop monitor. Not very high-tech capture, but I had just a few hours to prepare this one-time-only presentation. I'm trying to break several large video files (1.9GB) into Chapters. I'll put these chapters on a Jive server at work for my team to view. When I import the Video file from the camera (MTS / AVCHD video with a data rate of 6877 kbps, Frame of 29fps, 1440W and 1080H) the VideoWave application wants to convert it. It converts it to an MPG. I can break up the big file into little chapters easily enough. I've been experimenting with output formats. It seems that none of the ones I've tried thus far give a good output format. The original large file in MTS format renders well enough when it's uploaded to the Jive server, but I need it broken into smaller chapters, and I just can't seem to choose something with a high quality. Space is no issue on the Jive server. Creator 2009 Ultimate is not windows seven compatible! First of all C2009 is not compatible with W7. It amy seem to run for a while but will eventually fail. What do you mean you want to break up the video into chapters? Are you creating a DVD? That is the only place where chapters are used in Roxio. By "chapters" do you mean you want to break up the large file into smaller files? You have not given any details on what program from C2009 you are using. 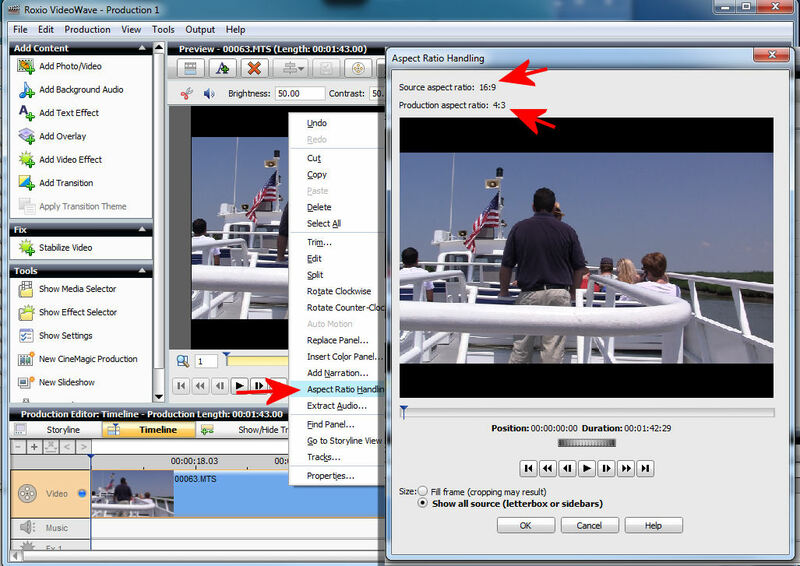 Videowave has dozens of options for format including various HD formats. I shouldn't have used the word "Chapters". I meant that I want to break up the large file into smaller ones, yes. If I upgrade to something like Roxio Creator 2012 Pro, what will it do when it imports my MTS file. Will it convert it to an MPG file like the 2009 version or will it convert it to something that is a little more dense? Hello. 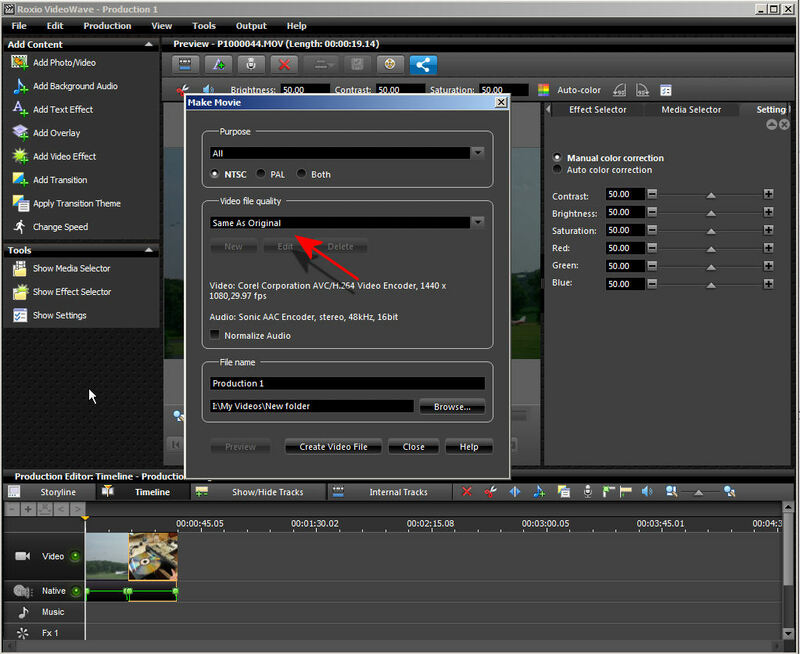 I upgraded to Roxio Creator 2012 Pro. It opens the MTS without converting it. ??? 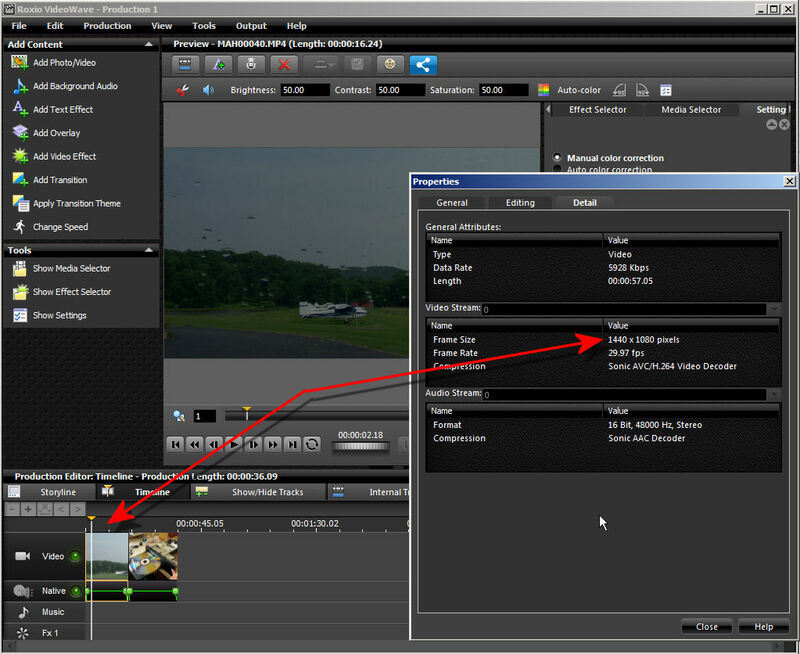 well, if you are using VideoWave (Edit Video-Advanced) you click on Export Video and select that particular format. I should ask at this point, WHY? 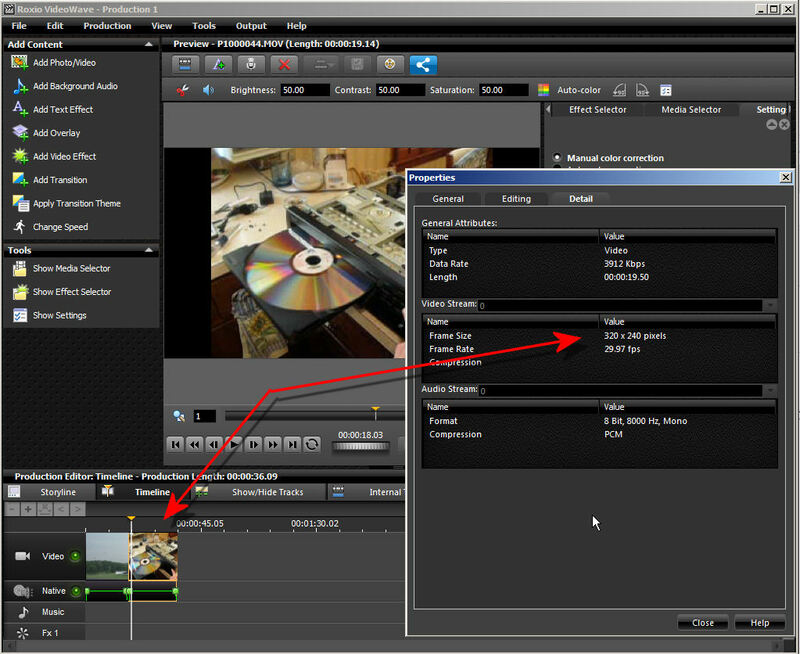 In VideoWave (Creator 12) I click on Output / Export. The problem is that I'm having a hard time finding a format that is high quality. The big file, xxxx.MTS is of high quality. But I can't seem to choose anything that is of similar quality. Ie tried several with "Best Qualiity" but they are nowhere as good as the original MTS. Any insights / suggestions? When Videowave opens choose 16.9. Whenever you are starting a new project and using HD Source, always select a 16:9 Project! That did the trick. I just hadn't considered the aspect ratio. 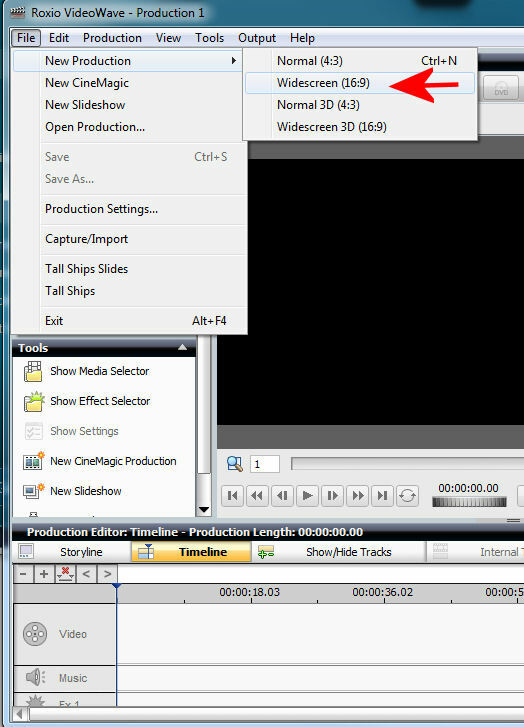 When I went to Output / Export As, I received the Make Movie pop-up with a lot more choices. 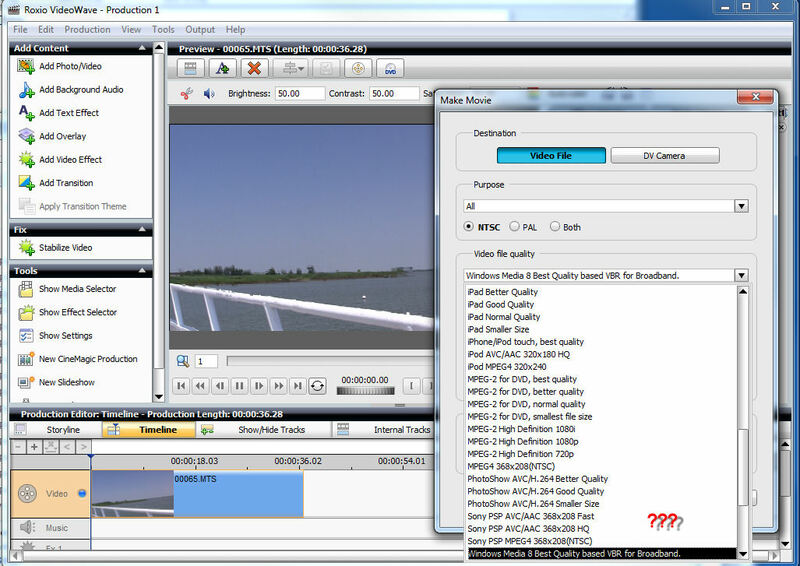 But the Video File Quality drop down still did not have the choice "Same As Original" like you did in your screen shot. It defaulted to the choice "Blu-ray AVC LP (NTSC)". That seemed to be the same quality as the MTS original. At least to the naked eye it's the same. So thanks for all your help. Now it's a point of curiosity. Why wouldn't I receive the "Same As Original" choice? Is it that VideoWave can't export to MTS? Am I missing a codec and VideoWave chose the next best thing? Just makes me wonder if I'm missing out on something. Again, thanks for your help. I really appreciate it. Look closely at the red arrows in post #8, set yours the same started with the 16.9 project. Yup! Double-checked it, looking very closely at the screen shots. It's exactly as you have it, except I do not have "Same As Original" as an option. FWIW my camera is Canon HF200. I downloaded the latest update of ZoomBrowser from the web. I have the same result. I just don't see the "Same As Original" option. Started with a 16.9 project? My Audio = MainConcept AAC Encoder, stereo 48KHz, 16 bit. 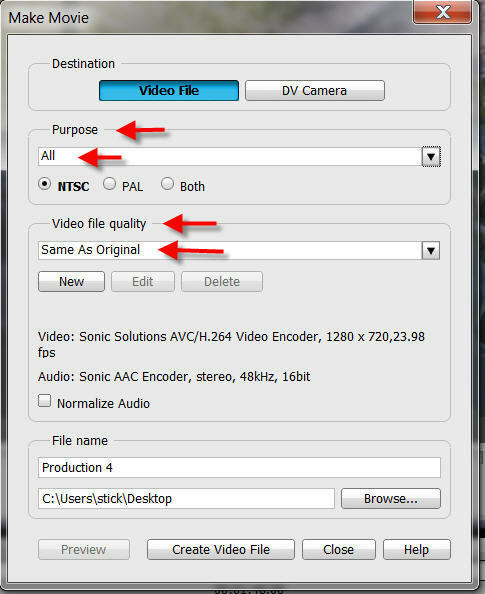 Your the only one that doesn't have purpose all, video file quality same as original? You will have to supply a lot more information other than "me too" to a year old thread. It would be best to start your own topic in the correct forum and exactly state your problem. 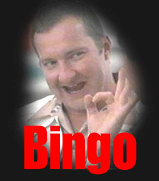 Has to a 16.9 project and the file added to the project has to be 16.9 to show 'same as original'. A 4.3 file added to a 16.9 project won't show same as original. Just tried it myself. New 16:9 project. 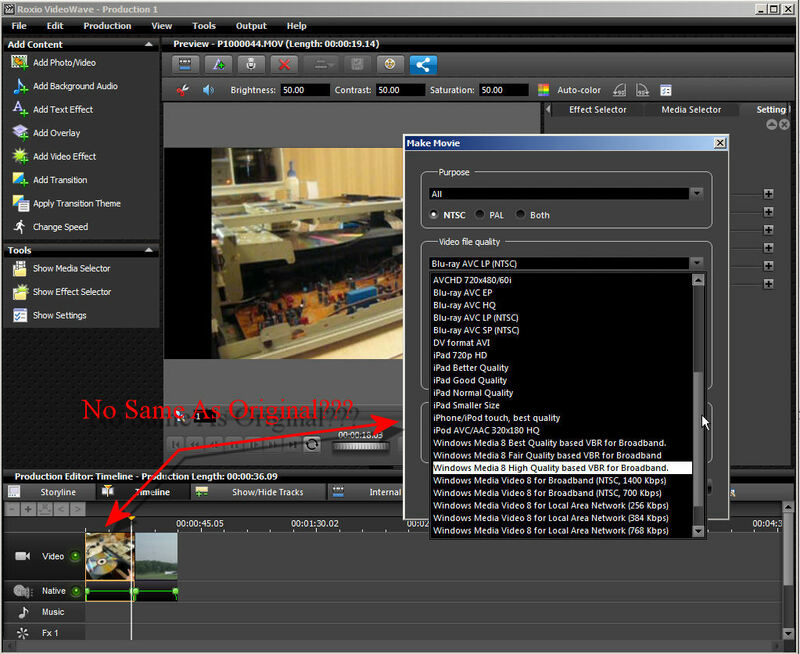 Add an HD .MTS file from my Canon camera, select Output -> All, and no option for "Same as original". I just checked and it worked as expected.